Love is in the air as February swings around again, and we have delicious ideas for celebrating Valentine’s month with your family. You’ll find three inspiring suggestions for memorable meals below, plus tips on how you can get all the kids involved in preparing the food, laying the table and creating fun decorations on a Valentine’s Day theme. Click on any of the links for recipes or instructions. TIP: Valentine’s Day falls on a school day this year – and for the next three years – so it’s a smart idea to plan your special celebrations for the weekends before or after 14th February, and to start making the decorations with the kids well ahead of time. And on the big day itself, don’t forget to tuck heart-shaped sandwiches, fresh red berries and a loving note from Mom into your little one’s lunch box. Mid-morning on a weekend is a great time to throw a gorgeous brunch, because it gives you and the family time to spend together in the kitchen preparing your Valentine’s feast. Kick off your brunch by offering everyone an ice-cold pink smoothie, made with any red fruit and NutriDay’s Double Cream Plain Yoghurt. If the kids are old enough, invite them to help slice the fruit and blend the smoothies, and to garnish each one with a heart-shaped strawberry. To find out how to make our Super Smoothies, click here..
Pancakes are such fun for children to mix, cook and flip. Serve them with fresh fruit, or with strawberry jam, and spoon over dollops of creamy yoghurt. If you don’t fancy pancakes, how about whipping up a batch of our Golden-Yellow Cupcakes and topping them with pink icing? If the weather’s fine, set the table outside in the sun. Cover it with a red, pink or white cloth, and ask the kids to arrange fresh flowers and greenery in glass jars or bottles. 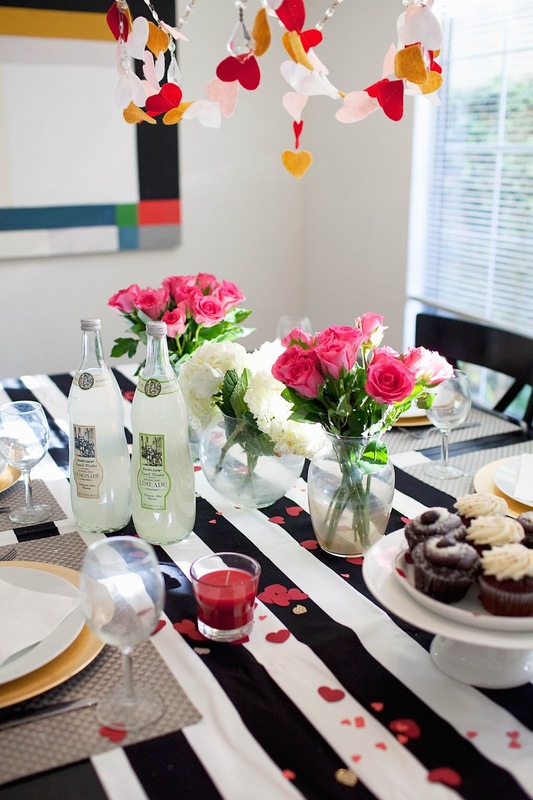 Scatter the cloth with small cut-out paper hearts, or make pretty paper-heart garlands to hang above the table. Finally, add a few jars or packets of heart-shaped ‘motto’ sweeties for the kids to enjoy when they’ve eaten their breakfast! There’s something magical about soft flickering candlelight, and the kids will love sharing a stylish Valentine’s dinner party in the company of the people they love the most – Mom and Dad. Ask everyone in the family to dress up for the occasion! Set the mood with a sensational summer starter: chilled cucumber soup served in pretty ice bowls. Making ice bowls with colourful flowers is a great activity for kids: click here to find out how. Kebabs are a great interactive food for kids because they can help you thread the meat and veggies on the wooden skewers. How about grilled beef kebabs done two ways, one for the adults and the other for the little ones? Children with more adventurous palates will enjoy our Chicken and Red Pepper Kebabs with a Peri-Peri Yoghurt Sauce. Whichever one you choose, make sure to serve your kebabs with a crisp green salad and plenty of crusty bread. For dessert, try Nutty Yoghurt SemiFreddo, a light, luscious ice cream with choc chips and crushed biscuits. Another super-easy option is our Marvellous Strawberry & Yoghurt Mousse, made with jelly powder. TIP: make and chill your desserts the day before – the kids will have fun whipping the cream for both these yummy treats. An elegant dinner calls for a simple, beautiful table setting! Cover your table with a white cloth, or with large sheets of white paper. Then lay out your best plates, cutlery and glasses – this is a special occasion, after all! You can involve older kids by asking them to polish the glassware and cutlery so everything sparkles. Younger children can scatter fresh pink or red flower petals over the table. Finally, add plenty of candles. Visit Pinterest to find inspired ideas for simple Valentine’s Day candles, candleholders and centrepieces you can enjoy making together. Everyone adores a picnic, and this is a great opportunity to spend a fun-filled afternoon outdoors with the kids. Find a shady spot under some trees, spread out a few colourful rugs and pillows, then enjoy a relaxed al fresco feast with your loved ones. And when the picnic’s over, organise ball games or a round of hide-and-seek through the park! Bite-sized snack- and finger-foods are best for picnics because they’re easy to transport, and you don’t need to fuss with cutlery. Remember to pack plenty of paper plates and napkins. Take along cherry tomatoes, cheese, Vienna sausages and toothpicks, together with a knife and cutting board. Show the kids how to create adorable mini-hearts – have a look at the picture at the top of this page, or click here for instructions. You can also use baby tomatoes and spring onions to make delightful edible tulips! For more interactive snacking, fill a big lidded container with an enticing selection of crunchy veggie sticks, cheese cubes, mini-meatballs, rolled-up ham slices and boiled eggs. Provide two or three interesting dipping sauces, such as hummus or yoghurt dips, then invite the kids to dunk away! For more substantial picnic fare, how about mini-shwarmas or healthy wraps? For a fine finish to a picnic, chill a watermelon overnight and take it to the picnic in a cooler bag. Here’s a smart idea for creating heart-shaped watermelon ‘lollies’. What special family celebrations are you planning for Valentine’s Day? Tell us on Facebook, or leave a comment below.